Farnham and Burlington: Ashgate 2011. xxiii+286pp. While scholars have long recognized Kierkegaard’s important contributions to fields such as ethics, aesthetics, philosophy of religion, philosophical psychology, and hermeneutics, it was usually thought that he had nothing meaningful to say about society or politics. Kierkegaard has been traditionally characterized as a Christian writer who placed supreme importance on the inward religious life of each individual believer. His radical view seemed to many to undermine any meaningful conception of the community, society or the state. In recent years, however, scholars have begun to correct this image of Kierkegaard as an apolitical thinker. The present volume attempts to document the use of Kierkegaard by later thinkers in the context of social-political thought. It shows how his ideas have been employed by very different kinds of writers and activists with very different political goals and agendas. 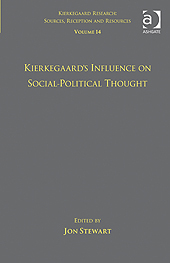 Many of the articles show that, although Kierkegaard has been criticized for his reactionary views on some social and political questions, he has been appropriated as a source of insight and inspiration by a number of later thinkers with very progressive, indeed, visionary political views.